Noted historian Martha A. Sandweiss tells the uniquely American story of Clarence King, a man who hid from his Gilded Age cohorts and prominent family the fact that he lived a double life---as the celebrated white explorer, geologist, and writer King and as a black Pullman porter and steelworker named James Todd. This biography tells the story of Clarence King, a Yale-educated geologist and explorer of the American West during the post-Civil War era. Dashing, charismatic, and beloved by New York's social elite, King was considered an honored dinner companion, witty conversationalist, and eligible bachelor. After his death, it was discovered King had a black wife and five children living in Brooklyn. Apparently, social pressures and racial tensions compelled King to construct a complicated double life. To his Brooklyn family, King was known as James Todd. Despite his fair complexion and Western European ancestry, he convinced his family he was a black Pullman porter who spent much of his time away from home, crisscrossing the country on its railways. In New York City, King lived as an accomplished scientist and bon vivant who mingled with the best society as the white man he was. Eventually, King's double life tore him apart and resulted in the financial, physical, and mental breakdowns that led to his death. Historians, and history itself, have not treated Clarence King kindly. King was at one time one of the most famous and admired people in the United States but, if you are like me, you likely have never heard of the man. Born into a wealthy family in 1842, King became famous as the geologist responsible for surveying and mapping diverse regions of the western United States. Always the self-promoter, he published a book about his adventures, "Mountaineering in the Sierra Nevada," that became a best seller of its day and made him into a national figure. Two of his closest friends were author Henry Adams and career politician John Hay, former secretary to President Abraham Lincoln. King traveled in the highest circles of society, even dining in the White House on at least once occasion. All of which makes even more astonishing the fact that Clarence King lived a secret life that even his closest confidants knew nothing of until King was near death or had actually passed. King's friends were well aware that King, the sole support of his elderly mother and an extended family, was hard pressed to meet his financial obligations. His financial difficulties were so serious, in fact, that King was only able to maintain his standard of living by accepting repeated loans from John Hay and others of his friends, often offering items from his personal art collection as collateral for the money loaned to him. What King's benefactors and admirers did not know was that, for some thirteen years, King was living two lives: one as the famous explorer of the American West and another as the husband of a woman who, in 1861, had been born into slavery in Georgia. King represented himself to ex-slave Ada Copeland as James Todd, an extremely light-skinned black man from Baltimore whose work as a Pullman porter required him to be away from home for months at a time. In a day in which a single drop of black blood was deemed to distinguish a black man from a white one, his story was believable enough for King to be accepted into the community in which Ada bore him five children. Clarence King loved Ada Copeland but he lied about their relationship because he feared the scandal that would result from his marriage to a black woman. He knew that by publicly acknowledging his black wife and mixed-race children he would lose his friends and any chance of earning the income necessary to support either of his families. Although Ada may have suspected that her husband had something to hide, even she did not know the extent of her husband's secrets until his confessional deathbed letter. Clarence King's story is a fascinating one and Martha Sandweiss tells it well. Almost as fascinating is what happened to Ada and her children after King's death. Ada, who lived to be 103 years old, did not die until 1964, outliving her husband by sixty-two years. "Passing Strange" includes an account of her determined effort during the 1930s to be recognized as King's rightful heir and the resulting court case that explains much of what happened after his death. If this were a movie, no one would believe it. First off it's hard to see what was the big deal about Clarence King. You come away inclined to agree that he was "one of the most overpraised men of the 19th century." I think most of his "genius" was that he could make effete literary types comfortable with natural science. That's not a bad thing, but the literary types tend to overstate its value. But he was pretty much a bum. He had this secret family and completely failed to provide for them. She wants him to be a great lover and a visionary of a race-blind future, but really he seems mostly to have been slumming and playing at being in love. He wrote love letters, but when it counted, he was somewhere else. He dodged the Civil War. He whines all the time about he oppressive weight of social propriety, but he doesn't resign any of those fancy men's clubs and he doesn't stop living high on his pals' money. He's a nasty misogynist. All the big tests of life he completely fails at. If you don't find King a compelling, attractive figure than you're not going to like the book much, maybe. Sandwiess' premise is that there is something really rare and strange in this cross racial romance, but I assume if you went to any southern city in 1900 every other house or so would have a white guy carrying on some kind of affair. Remember Strom Thurmond? And also what does she think they were doing on all those camping trips and cruises to see exotic "dusky" women? Playing cards? When Clarence King died in Phoenix, Arizona, in 1901, he was eulogized by friends like John Hay, private secretary to Abraham Lincoln and Secretary of State under McKinley and Theodore Roosevelt, and historian and memoirist Henry Adams. He was remembered as the first director of the United States Geological Survey, the man who exposed a diamond hoax that threatened the economy of the United States, a devoted son and confirmed bachelor. He was all those things, except the last. The man who, in 1880, said that he had lost the only woman he had ever wanted to marry through too much attention to duty, in 1888 married a woman so far outside his social circle and standing that he did so under a false name, a false occupation, a false identity and a false race. For Clarence King, son of a prosperous China trader, interlocutor of Ruskin and Turner, guest at the White House, had fallen in love with Ada Copeland, an African-American woman born into slavery. He courted her under the name "James Todd", and told her he was a Pullman porter, a job which must mean that he, too, was African-American. When King was dying in Arizona, away from his wife and family in New York, he finally revealed his secret to her, via letter, and to certain of his friends. Because he had kept Ada in the dark as to who he was and what his real life was, because, in order to keep his secret, he had left no documentation of their relationship other than his letters to her (obviously, though, not under his real name), she had no idea of his true financial situation either. And he had, foolishly, made no provision for them in his will, which left everything to his mother. Based on things that he had told her, Ada believed that he had left money in trust for her and the children, and his friends arranged to have money sent to her each month, which she believed came from that trust. It was not until many years later that Ada sued in court to obtain the funds she believed were rightfully hers. The forces of privilege were marshalled against her. Ada King died in 1964 at the age of 103. Did she hear Martin Luther King, Jr. speak of his dream that "the sons of former slaves and the sons of former slaveowners will be able to sit down together at the table of brotherhood" and think of her own life? Did she hear "I have a dream that my four little children will one day live in a nation where they will not be judged by the color of their skin but by the content of their character" and think of her husband and children, whose races were judged, not by the color of their skin, but by the company they kept? 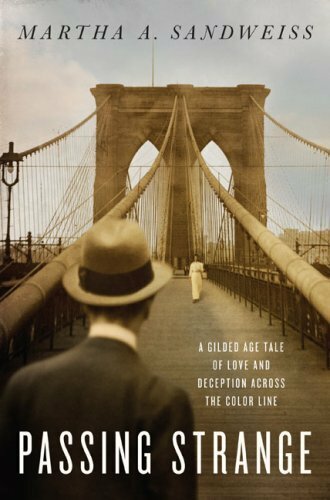 Sandweiss has written an engaging account of the lives of King and Copeland, separately and together. She has illuminated their relationship, and Ada's later legal efforts, through the prism of American social, class and racial mores. Her work is thoroughly researched, through interviews and consultation with primary sources, and any speculation (for instance, as to where and how the two may have met) is clearly labeled as such and is backed by credible argument. Martha Sandweiss is an academic and an historian. That description might drive away some readers and attract others. I knew about Clarence King as one of the early explorers who mapped the West. I had read something of his double life in Patricia O'Toole's book Five of Hearts, about the charmed circle around Clover and Henry Adams in the late 19th century.